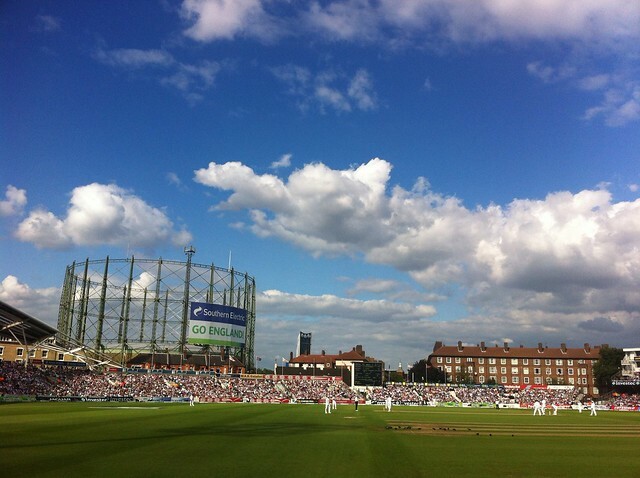 Here is the final mini-session analysis for the first test between England and South Africa at The Oval, London, England. Stumps, Day 1: England lead the mini-session count 5-2. The day started sensationally with Morne Morkel hitting Strauss in the pads with his 4th ball. His LBW appeal was turned down, but Smith decided to review it and the decision was overturned: Strauss lbw Morkel 0 in the first over. From that point South Africa had next to nothing to celebrate for 4 hours. Cook and Trott attempted to bat South Africa into the ground. 170 runs in just over 56 overs. Hardly break neck pace, but very effective. The fall of the wicket hardly did anything to speed up the scoring rate at first either. Pietersen only scored 3 off his first 20 balls. However he exploded from there (in the context of the match) scoring 39 off his next 51 balls before gloving a short ball from Kallis through to de Villiers. The pitch seemed quite slow, but occasionally one carried through quite well. It could be a pitch where bowlers get good results from bowling cutters and cross seam deliveries in order to exaggerate the inconsistent nature. One of the beautiful things about test cricket is that it often leaves you with as much anticipation after the first day as it had before it. This is one of those tests. When Cook resumes on 114 tomorrow morning there will still be everything to play for. First drinks, Day 2: England lead the mini-session count 5-3. 3 wickets for 19 runs in 13 overs. That is a very comprehensive hour. The match is actually quite even, despite England leading the mini-session count. Lunch drinks, Day 2: England lead the mini-session count 6-3. England managed to take this mini-session, and are back in the lead in the match. I think about 400 is about par for this pitch. England are on track to get close to 400, but there is a lot of cricket left in this match. Despite England leading the count, I feel South Africa are probably slightly ahead. The bookies, however, have the draw as favourite, followed by England. It will be interesting to see if the pitch does start to play tricks. Apparently the groundsmen have made an effort to keep water off the block due to the rain in England this year. This might mean that it does break up more than would be expected after such a wet summer. Interestingly it was a day without anyone really starring. A few bowlers picked up 1 or 2 wickets. Amla looked good for 47, and Prior batted well for his 60, but there were no really stand out performances. If England manage to bowl out South Africa near the end of the day tomorrow for about 350, we could have an epic finish on our hands here. Stumps, Day 3: South Africa lead the mini-session count 10-8. A day of disciplined bowling, and disciplined batting. England managed to keep South Africa to about 3 an over, but only managed to remove Graeme Smith. Smith is now just 223 runs away from taking Bruce Mitchell's record for the most runs in England for South Africa that has stood since 1947. I heard a commentator say that it was difficult to take wickets as the pitch was too good. I'm not actually sure that a pitch where 12 wickets fall in 261 overs is actually a good pitch. I think a good pitch should have a wicket fall every 12 overs or so, not every 22 overs. However if it breaks up early tomorrow and is a minefield by the end of day 5, I might have to review my assessment. South Africa will want 4 sessions to bowl England out, but it is unlikely they will get sufficient runs for Smith to declare in 2 sessions tomorrow, so the draw should certainly be favourite now. David Trist once said that to win a test match you should bowl one third of your overs as maidens. That way you are creating pressure on the batsmen. Both teams have bowled about one sixth. The batsmen have found this pitch too easy. To the credit of Amla and Smith however, they cashed in on the conditions more than the English batsmen (except Cook) did. The South African batsmen were fantastic. George Dobell summed it up well when he said "There may be some doubts about the South Africa tail, but when the head and the body are as strong as this, it is not the most pressing of concerns." The grind continues. Kallis has done his best impression of a snail. He's scored 8 runs off 56 balls. That is less than one an over. Amla was more positive, with 24 off 34. England have bowled with discipline, but no imagination. Their approach works normally, but 439/2 should suggest to the English bowlers that they need to change things up. This game no longer looks either evenly poised or headed for a draw. South Africa have taken the game by the scruff of the neck. The Kallis and Amla partnership is the 3rd largest partnership for South Africa. It's the 3rd largest partnership for South Africa. The 6th largest 3rd wicket partnership. The 5 largest partnership against England. The 2nd largest unbeaten partnership. It's also the 23rd largest partnership of all time. Amla's innings is the largest by a South African. The 4th largest against England. The 4th largest in England. The 5th longest innings in terms of minutes, and the longest unbeaten innings in terms of minutes. It was the twentieth largest innings of all time. This was also only the 4th time that a South African team had had 3 players score over 130 in the same innings. All of this is to say simply that the South African innings was very good. And the English bowling got worn down. If England go on to lose by an innings, which looks quite likely at this point, then it will be the 4th largest first innings total to result in an innings loss. This is all so unexpected after day one. It is really quite a remarkable turn around. Strauss dropping Amla on 40 may be the most expensive dropped catch in the history of test cricket. The question now is if this game has another twist. Can Bopara, Bell, Prior and/or the bowlers bat England to safety. It would be remarkable if they do, but there has been a steel about this English team recently that means that it is not inconceivable. England have lost another wickets, with Ravi Bopara going for a slash outside off and seeing a wide ball crash into the middle stump. Bell has looked solid, despite one nervous moment against Tahir. He and Prior could put together a large partnership, but if they get broken up too soon, it's hard to England making it to the end. Andrew Strauss put down a difficult chance off Amla when he was on 40. At that point England were on top in this match. The South Africans did not relinquish the momentum. They are a very hard team to stop once they are on a roll. The game was very comprehensive, and South Africa deserve all the accolades they are inevitably receiving, however I don't think that this match is a fair reflection of the relative strengths of the two sides. England had to bat and bowl in the most difficult conditions for both. Days 2 and 5 were the only days where the ball really misbehaved. South Africa had the best of the conditions, but they made them count well. The remarkable thing was how long it took before the South African batsmen were able to start punishing the bowling. It was roughly 10 hours before the English bowlers started to lose their menace, and even then they still mostly kept to the plan in the last 3 hours when they were getting belted. It was just that the plan did not work. It will be interesting to see what Flower, Strauss and co. come up with for the next test. I hope that they don't do what English teams of the '90s did in this situations and make wholesale changes. Flower has so far shown that that is not his style. The next test will be an entirely different prospect. The ball will probably swing at Headingly and so Steyn, Philander, Anderson and Bresnan will be a much more interesting prospect. We could have a totally different style of match. I, for one, can hardly wait the 10 days until the next game.